No reaction is observed against other related cyclin dependent kinases. cdk9(PITALRE) interacts with a conserved domain in the TRAF-C region of the tumor necrosis factor signal transducer TRAF2. The positive transcription elongation factor b (P-TEFb) is identified as cdk9 paired with cyclin T1. Our Abpromise guarantee covers the use of ab6544 in the following tested applications. WB 1/500 - 1/1000. Predicted molecular weight: 43 kDa. Immunohistochemical staining of mouse tissue using anti-cdk9 (PITALRE) antiserum. 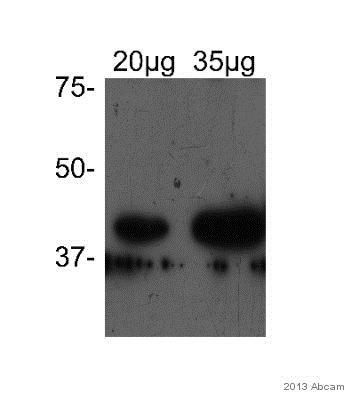 The staining shows the location of cdk9 / PITALRE protein in developing mouse tissue. Arrow indicates area of high expression. Immunocytochemistry/ Immunofluorescence - Anti-Cdk9 antibody (ab6544)Image from Qi T et al., J Biol Chem, 286, 15171-81. Fig 3.; doi: 10.1074/jbc.M110.184374. Epub 2011 Mar 4. 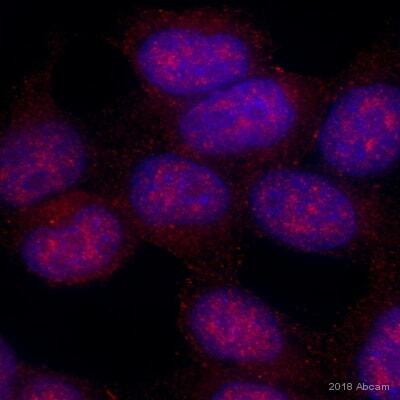 Immunofluorescence analysis of HeLa cells, staining Cdk9 (red) with ab6544. The cells were fixed with 4% paraformaldehyde and permeabilized with 0.5% Triton X-100 for 10 min at 4°C. The cells were incubated with 0.05% PBS-T before incubating with primary antibody at 1/2000 dilution. Publishing research using ab6544? Please let us know so that we can cite the reference in this datasheet. We are currently looking for an antibody that recognizes the zebrafish Cdk9 protein for Immunoprecipitation / Western blot experiments. 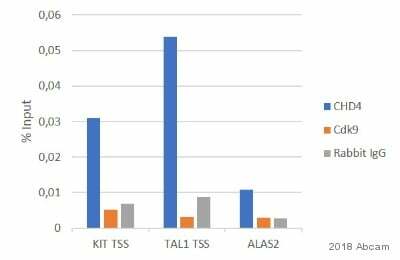 Based on sequence homology of the recognized epitope or informations that you might have, could you tell me if one of your products would be likely to detect the zebrafish Cdk9 protein? We have three antibodies which may interest you as they are all tested for both IP and WB.In addition,the homology between the two species is 100% for this protein, therefore,it seems very likely that those antibodies will react with zebrafish material. https://www.abcam.com/index.html?datasheet=6544 (or use the following: https://www.abcam.com/index.html?datasheet=6544). https://www.abcam.com/index.html?datasheet=10874 (or use the following: https://www.abcam.com/index.html?datasheet=10874). https://www.abcam.com/index.html?datasheet=76320 (or use the following: https://www.abcam.com/index.html?datasheet=76320). I can offer a discount off a future purchase if you buyone, two or allantibodies now, test it/them in zebrafish and submit feedback to us in the form of an Abreview for the tested antibody. It doesn’t matter whether the Abreview is positive or negative, we would just really like to receive your feedback. The discount would be to the value of 1 free primary antibody (again for either one, two or all, depending of . 1. Reply to this e-mail to let me know that you would like to proceed and testone or more of the antibodiesin zebrafish. I will then send a discount code. This code must be issued before purchasing one or more of the antibodies so please wait for my reply before ordering. 2. Purchase one or more of the antibodies either by phone, fax, or online (www.abcam.com). 3. Test it in zebrafish. We are always pleased to obtain feedback about our products and any information is greatly appreciated! Even if one or more of the antibodies turns out to be unsuitable for zebrafish, you will still receive the discount on your next purchase after your Abreview has been submitted.